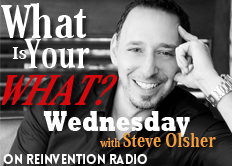 With all that’s going on in the world Steve relates it to an integral part of his book where he shares, “Life starts over right now. And again… right now.” The Reinvention Radio Crew then reflect on the Las Vegas massacre and how it has impacted them. We never know what tomorrow will bring and we cannot take tomorrow for granted. Richard believes there is way more good than bad going on right now. Mary suggests not waiting until tragedy strikes to make a change in your life — do it now. And always be kind to another another.